Even before their huge investments in supporting conservative candidates and “grassroots” Tea Party activists, Charles and David Koch were spending millions on college and university campuses to create academic centers that would advance their extreme libertarian, free market ideology. While only a tiny minority of academic economists embrace the fanciful idea that a complex, market economy could operate efficiently without an extensive regulatory apparatus and substantial government investments in infrastructure, education, health, research, and other public services, the Kochs want to use their millions to vastly expand the impact on both higher education and public debate of this small band of true believers. Yes, many philanthropists as well as groups like the Center for Engaged Scholarship use resources to encourage certain types of scholarly work. But what the Kochs are doing is different; they consistently seek to override standard academic governance procedures by tying their donations to the appointment of specific individuals who share their ideological position. This is the equivalent of creating an endowed chair in physics, but saying it can only be held by a scientist who denies the existence of climate change. In reality, what they are doing is pretty much the same thing because the economists they fund usually insist that regulations to limit greenhouse gases are both unnecessary and harmful to the economy. This is not accidental since Koch Industries is heavily invested in fossil fuels.Lately, the Koch Brothers have tried to disguise their political agenda by invoking “Eudaimonia”—a Greek word that can be translated as well-being or human flourishing. But the institutes they are creating to foster eudaimonia are pushing the same old extreme libertarian line because that, of course, is the only path that will assure that human beings will flourish. Fortunately, faculty at Wake Forest University in North Carolina has seen through this ploy. Their Academic Senate recently released a report that explains with great clarity why the university should refuse the funds proffered by the Kochs. What follows is a key excerpt from that academic senate report. So what are the specific aims and objectives of this Koch-lead network of funding in higher education? There are numerous sources one might consult to answer this question. Richard Fink, a close advisor to Charles Koch, outlined key strategies and objectives in a paper entitled “The Structure of Social Change.” And journalist Jane Mayer provides an in-depth analysis of Koch efforts in the political and academic spheres in her New Yorker articles and 2016 book Dark Money. But perhaps the most cogent and condensed presentation of Koch aims in higher education comes from two CKF vice presidents who led a panel, recorded and transcribed, entitled “Leverage Science and the Universities” at the June, 2014 Koch Summit. These well-known but highly secretive “summits” are held twice a year (since 2003) and now, by special invitation only, attract five hundred or more very wealthy donors. 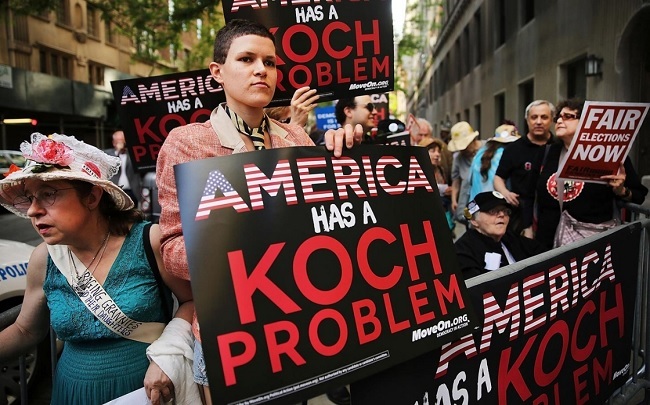 Officials from Koch Industries and the Koch foundation moderate most of the panels at these gatherings, and Koch’s network of donors coordinate/fundraise for the next 6-12 months of spending on political campaigns, political front groups, think tanks, and universities. Representatives at Koch-funded centers, institutes, and think tanks may be invited to these summits to meet donors and make a pitch for their cause.The panel in question (“Leverage Science and the Universities”) is an ongoing seminar that presumably explores different ways to “leverage” donor investments in science or higher education for various shared goals of the coalition. Ryan Stowers, Director of Higher Education at CKF, then expands on the specific aims of CKF in higher education before introducing each of the four panelists. We highly recommend a full reading of the transcript from this recorded panel session. It provides a unique glimpse into these secretive summits. For the purposes of this presentation, here are the key aims of CKF efforts in higher education as outlined by Stowers. “Not only does higher education act as a talent pool stream where teachers and professors operate other new programming, but also the students that graduate out of these higher education programs also populate the state-based think tanks and the national think tanks. Six think tanks are working on freedom initiatives. And then also, they become the major staffing for the state chapters on the grassroots innovation around the country. So you can see [that] higher education is not just limited to impact on higher education. The students who aren’t interested in becoming professors, but are interested in what we’re – I’ve got to be careful how I say this more broadly, are very interested and then they, they populate our, our program, these think tanks, and grassroots. And as we pointed out, that group of students taught in these centers, that we’ve been able to produce two million or so grassroots. And they in turn work with the (inaudible) sector that even talks to the media that talks to (inaudible). So the network is fully integrated. So it’s not just work at the universities with the students, but it’s also building state-based capabilities and election capabilities, and integrating this talent pipeline. So you can see how this is useful to each other over time. No one else, and no one else has this infrastructure. We’re very excited about doing it. To promote its free market ideology on campuses throughout the country by establishing research centers and institutes. To identify and fund “market friendly” scholars. To create a “talent pipeline” for future scholars, think tanks, and grass root political efforts. To influence local, state, and federal political legislation and social transformation. Put succinctly, CKF stated aims in “leveraging” higher education are to convert students to their free market ideology, feed the pipeline to their think tanks and institutes, and, through their “network” of scholars, impact state and local policy. This massively funded and nationally orchestrated strategic effort is unprecedented in higher education. While there is probably sincere faith in the “free market” principles espoused by CKF, its partners, and scholars in the “network,” one would be remiss if one overlooked the considerable financial returns the first two groups garner as a result of the stated goals of these efforts—lower taxes and reduced government regulations. This latter point is worth highlighting. The way in which this agenda benefits the private interests of the donors as much or more as the public weal is deeply disturbing. It also points to a conflict of interest inherent in the proposition itself given the make-up of the donor base. BASED ON THESE FINDINGS ALONE, IT IS THE VIEW OF THIS AD HOC COMMITTEE THAT WAKE FOREST AND THE EUDAIMONIA INSTITUTE SHOULD SEVER ALL CONNECTIONS TO THE CHARLES KOCH FOUNDATION AND ITS UNPRECEDENTED AND WELL DOCUMENTED EFFORT TO COOPT HIGHER EDUCATION FOR IDEOLOGICAL, POLITICAL, AND FINANCIAL ENDS. ANY INSTITUTIONAL ASSOCIATION WITH CFK’S HIGHER ED STRATEGY DAMAGES THE INTEGRITY AND SULLIES THE ACADEMIC REPUTATION OF THE UNIVERSITY, REGARDLESS OF HOW MANY PROTECTIONS MAY HAVE BEEN PUT IN PLACE OR HOW INTERDISCIPLINARY THE INSTITUTE’S STATED MISSION MAY BE. 1 In this report, Fink outlines three steps to converting private money into policy change. (1) Fund scholarly activity at universities to create “intellectual raw material”; (2) fund think tanks to convert that abstract raw material into digestible form (i.e., reports, policy briefs, lobbying materials, etc. ); (3) fund political groups and politicians in order to produce legislation. 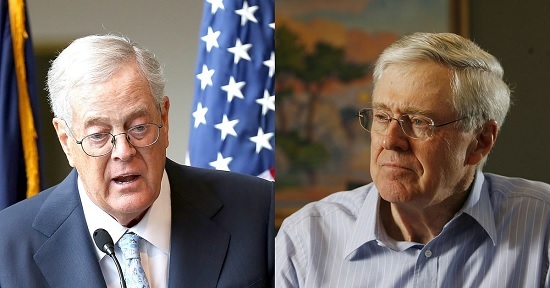 2 With respect to the 2010 Koch gathering in Aspen, Colorado, Jane Mayer notes that “Of the two hundred or so participants meeting secretly with the Kochs in Aspen that June, at least eleven were on Forbes’s list of the four hundred wealthiest Americans. The combined assets of this group alone, assessed in accordance with the magazine’s estimates of their wealth at the time, amounted to $129.1 billion” (Dark Money, p. 256). 3 Here is how the former president of APEE, Bruce Benson, described these donor summits to representatives at Florida State: “Charles Koch has organized a group of Foundations with similar agendas that meet twice a year to discuss funding strategies, etc. If some version of this proposal is agreed to, Koch will invite representatives from FSU to these meetings, introduce us, allow us to make our pitch, and encourage others to join them in funding the program. Koch has a huge endowment, and if this works out, they are likely to provide more support in the future” (Benson Memo, 2007). 4 It is worth noting that Gentry is also on the board of Freedom Partners, the Koch led political wing that supports various Republican politicians and conservative groups.